The Gulf of California is located between the Mexican mainland and the Baja California Peninsula. The length of the gulf is about 750 miles and its average width is 95 miles. It is also known as the Sea of Cortez. The entire gulf covers an area of 62,000 square miles. It supports an extraordinary diversity of marine life featuring many species of sharks, reef fish, marine turtles etc. It is one of the most important fishery regions of Mexico and also important for sport fishing. There are a total of 37 major islands in the Gulf of California. The two largest ones are Isla Angel de la Guarda and Tiburon Island. Scientists believe that most of these islands in the gulf are formed due to some kind of volcanic activity. These waters are also an important breeding region for Blue Whale along with other whale species including Orca, Fin, Humpback etc. It is also home to the Vaquita which is the smallest porpoise in the world and also one of the most endangered species. This gulf has a coastline stretching approximately 2,500 miles. It runs along Sonora, Baja California Sur, Baja California and Sinaloa. The storms that usually hit the Gulf of California are given a common name ‘Chubasco’ (strong winds along with thunder and lightening). For the extreme marine diversity of the gulf, it is also described as the ‘world’s aquarium’. The gulf is home to a wide range of different endemic creatures as well as many migratory species. Declan, Tobin. " 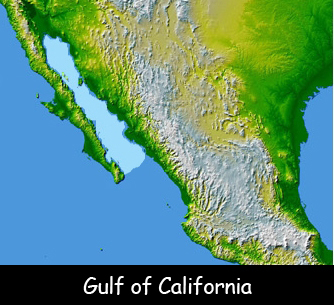 Facts for Kids about Gulf of California ." Easy Science for Kids, Apr 2019. Web. 20 Apr 2019. < https://easyscienceforkids.com/gulf-of-california/ >.